In this, Stern seems to be supported by scholars: She is completing a yearlong fellowship at the W.F. Albright Institute for Archaeological Research in Jerusalem. An expedition to the Southern Galilee a few hours north ends at the site of one of the country’s richest burial sites: Beit She’arim. It is both national park and necropolis; a city of the dead dating back to the first century. There are more than 30 excavated tombs here. “This morning, mass began with something that most of us probably take for granted, and hardly think about. We do it so often. It’s the sign of the cross. It’s not just a gesture that we use to punctuate prayer. It’s not just a sign of our Catholicity. It’s due for release in 2013. Nine years ago, my life changed forever. When my wife Colleen and I were married, we made a permanent decision to love; to give ourselves to each other freely and completely. In doing this, we entered into a profound and intimate relationship; we became a one-flesh covenant in communion with Christ through the gift of sacramental grace. The life-giving bond that Colleen and I share is so powerful and so real that we had to give that love names: Claire, Angela, Benjamin, and Sophia. Children are the result of the central act of sacrifice and worship between a husband and wife, namely, the union of their bodies in the conjugal act, which mirrors the total gift of self by the Eucharistic Christ to his Church. Together, the married couple forms a lifelong, self-donating, and indissoluble union of love: a “communion of persons intended to bear witness on earth and to image the intimate communion of persons within the Trinity” (William E. May, Marriage: The Rock on Which the Family is Built , 65). Marriage and, indeed, all the sacraments, tell us something about who God is. Marriage, in fact, reflects the reality that the Father, Son, and Holy Spirit are of one divine nature, essence, and substance, for Scripture tell us: “God created man in His image; in the divine image He created him; male and female He created them” (Genesis 1:27), and again “‘this at last is bone of my bones and flesh of my flesh; she shall be called Woman, because she was taken out of Man.’ Therefore a man leaves his father and his mother and cleaves to his wife, and they become one flesh” (Genesis 2:23-24). In creating husbands and wives, God has made two things very clear: first, that the one-flesh union between a husband and wife reflects His own divine image and likeness, and second, the fact that husbands and wives are truly equal does not mean they are the same person or have the same role in the marriage. St. Paul is saying that wives should put themselves under the mission of their husbands. What is the mission of the husband? Verse 25: to “love your wives as Christ loved the Church.” How did Christ love the Church? He gave himself up for her; he died for her. Jesus tells us, ‘I came into the world not to be served but to serve’ and to lay down my life for my bride. “The husband’s headship in the family derives from the fact that he is the chief servant” (Christopher West, audio tape, “Sacramentality of Marriage”). Read the piece in full at Ignatius Insight Scoop here. A blessed Father’s Day, to all those whom God has chosen to entrust His little creations to for love and care. 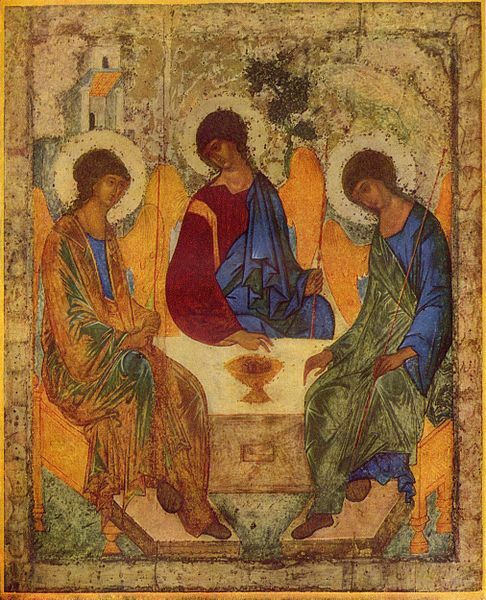 Trinity Sunday is the first Sunday after Pentecost in the Western Christian liturgical calendar… Trinity Sunday celebrates the Christian dogma of the Trinity, the three Persons of God: the Father, the Son, and the Holy Spirit.